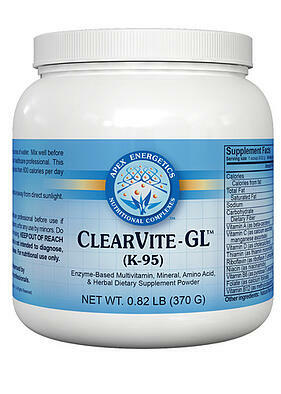 ClearVite-GL™ (K95) is based on on our popular ClearVite™ formula and is designed to offer gastrointestinal and metabolic support. * This formula includes the powerful combination of hypoallergenic nutrients, amino acids, and minerals that our other ClearVite™ products have, but excludes sources of rice and pea protein for those with sensitivities to grains or peas, or who require low carbohydrate content. * It also contains no sugars, which makes it ideal for anti-yeast diets. * ClearVite-GL™ is also intended to support liver detoxication and chemical biotransformation with targeted nutritional cofactors. * It offers a pleasant, fruity flavor. Mix 1 scoop with up to 4-6 ounces of water. Mix well before drinking. Use once a day, or as directed by your healthcare professional. This product should not be used in a diet supplying less than 600 calories per day without complete medical supervision. Proprietary Amino Acid Blend: 5025 mg* of L-Glutamine, L-Alanine, Glycine, L-lsoleucine, L-Tyrosine, Proline, L-Asparagine, L-Threonine, Taurine, L-Valine, L-Cystine, L-Serine, L-Lysine (as L-lysine monohydrochloride), L-Arginine (as L-arginine HCI), L-Phenylalanine, N-Acetyl L-Cysteine, L-Glutamic Acid, L-Leucine, Acetyl L-Carnitine HCI, L-Tryptophan, L-Histidine, D-Aspartic Acid, L-Methionine, L-Cysteine (as L-cysteine HCI). Proprietary Clearvite™ Blend: 1760 mg* of Medium Chain Triglycerides Oil, Evening Primrose Oil (seed), L. Acidophilus, Milk Thistle Extract (seed), Quercetin (as quercetin dihydrate), Hesperidin (from Citrus sinensis fruit extract), Rutin (from Sophora japonica bud extract), Jerusalem Artichoke (tuber), Enzyme Blend (cellulase, amylase, protease, glucanase, lipase), Marshmallow Extract (root), Gamma Oryzanol, Choline (as choline bitartrate), Ginger (root). Other ingredients: Natural flavor (berry pomegranate), luo han guo fruit extract, sodium bicarbonate, sea salt.